The funny thing about this product is that I meant to write this review about three years ago- but then I forgot. But then one of our fans reached out on our facebook page and asked me if I had ever heard of this special protein powder from About Time. I tracked down the protein in question and was pleasantly surprised to see this familiar branding staring back at me. Where had I seen that before? Well I had seen it while conducting a super basic search for natural pre workouts to review here on the blog! I hatched a fantastical idea right then and there. I’ll review both of these products. Today I’ll review the pre workout, and then on Friday I’ll go ahead and review the protein powder. I wanted to give the pre workout a try right away because believe it or not I ran OUT of pre workout. And Heaven knows I do NOT workout without getting a full dosage of energizing pre workout in my system. So. Is AUX, in fact, energizing? We’ll find out. After I tell you how it tastes, that is. Ok. This pre workout tastes pretty dang good. I tried the passion fruit flavor and found it overall very enjoyable. The thing that you should know about AUX, is that this is a natural pre workout. I would put it in the same arena as Athena, Raw Tea, and Vega Energizer. Those are the other three natural pre workouts that I can think of off the top of my head. The ‘natural’ thing basically means that these are rather low-stim products (with regard to caffeine content), and also that they do not include artificial flavors or sweeteners. Now. Usually that means that they also don’t include good taste. That usually means they taste like sand (looking at you Raw Tea), or dirt (yep that’s you Energizer), or, in rare cases they’ll actually taste quite pleasant (that’ll be you, Athena). But now in the same realm as Athena I would have to put AUX- as a pre workout that uses natural flavoring and actually tastes really good. I mixed one and a half scoops of Aux Auxiliary Energy pre workout into ten ounces of super super cold water (always remember that pre workouts taste BEST in the COLDEST water possible). The product mixed together really nicely and did not leave any real residue or clumping in the glass. I swirled it around with a fork about two minutes or so just to be sure. My first sip was the best. The initial taste is really tropical and fruity- and then finishes with some tartness, and then the unmistakable hint of stevia. Almost like the bottom of the flavor falls out. You know what I mean? It’s like in your head you go ‘oh this is super good’, but then as you swallow, the flavor sort of disappears and your left slightly dissatisfied. It happens with all the stevia products in my opinion. But that’s really the only knock I have on this product flavor-wise. It’s really a nice taste that’s fun and fruity, with no really bad aftertaste or anything. Nicely done, About Time. So far so good. But how does this pre workout perform? You know when I start a section with ‘hmm’, that it’s probably not the going to be the best conversation. You know what I mean? (talking to you, my ex boyfriends :P). Alas, I have to start the performance review grade with a classic ‘hmm’. And that’s because this pre workout just does not really do it’s job. A pre workout’s job is to get you fired up to go get into the gym and crush it. Sure, the pre workout is supposed to give some endurance benefits and maybe keep you hydrated to a certain extent. And maybe it’s supposed to have some vitamins and micronutrients to support overall health. But in my humble, and incredibly well-versed opinion (when it comes to pre workouts anyways), these products absolutely MUST have an energizing component so that they help you dive into your workout with your sleeves rolled up high and ready to rock. But AUX Auxiliary Energy just doesn’t do this. You drink it, and you sit, and you wait for the fun to start. And then it kinda just doesn’t. So you go to the gym and start your workout with just sort of a ‘sober’ attitude. Now, you know from my other reviews that I’m an absolute stim-junkie who loves the feeling of 400 mg of caffeine raging through her veins. So, yeah, several products have gotten the knock on being too mild in the energy department. But honestly Aux brings it to another level. Stuff is just very ‘quiet’. What I like about this formula, and the reason why it has earned a very respectable B plus from me in the formula department, is that they included a super high-performance ingredient in the GlycoCarn GPLC. I’ve always been a huge fan of GPLC (Glycine propionyl-L-carnitine hydrocholoride)- AKA Carnitine in it’s most beautiful (and most expensive form). Carnitine supplementation has been studied ad-nauseam and has been a proven performance enhancer by way of optimized ATP re-synthesis. 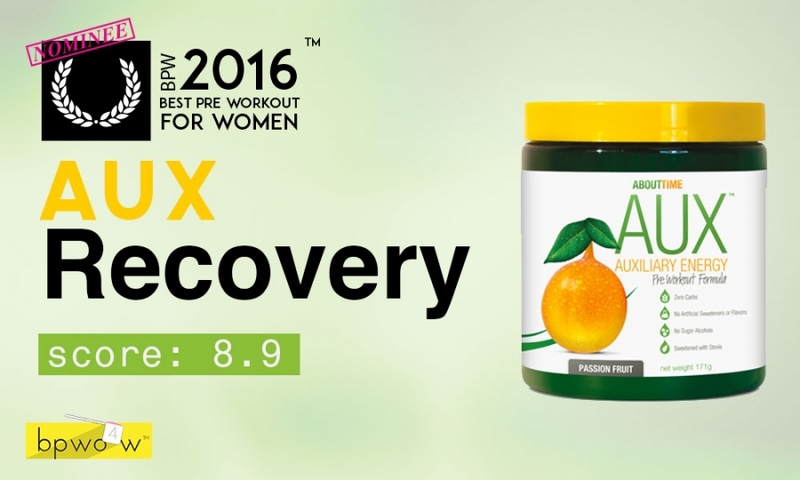 Other significant ingredients in AUX include yerba mate and citrulline. Citrulline is the world’s most popular ‘pump’ ingredient that is also highly functional and a proven performance booster in its own right. Yerba mate is a trendy herb that is probably responsible for the heightened focus that I experienced throughout my workout. Overall I think this is an intelligent formula that is transparently dosed, and likely has resonated with a certain audience. Let’s talk packaging and then wrap this puppy up, shall we? I’m giving the Aux pre workout by About Time a B plus on packaging because mostly I’m in a good mood, and because it isn’t bothering me as I sit here looking at it. As you know, I’m probably the biggest packaging snob in the world. So the fact that the packaging isn’t peeving me off is only a positive. What do I like about this packaging? First off I think I have to give About Time props on using a green jar. It has a nice high quality appearance and feel that you really don’t find in other pre workouts. In fact AUX may be the ONLY pre workout that I’ve ever come across to utilize a green semi-transparent bottle. Pretty cool, right? Speaking of cool. The yellow lid, while also un-orthodox, is strangely at home atop the green jar. The colors of the label are soft, and nicely complement one another, and the product as a whole. I don’t think I’m crazy about the plain white backdrop to this label. But. Hey. It’s subjective right? Wrong, I’m always right. (Grin emoji). But in summary a nice enough job on packaging. It has it’s own style, and it’s pretty cool.